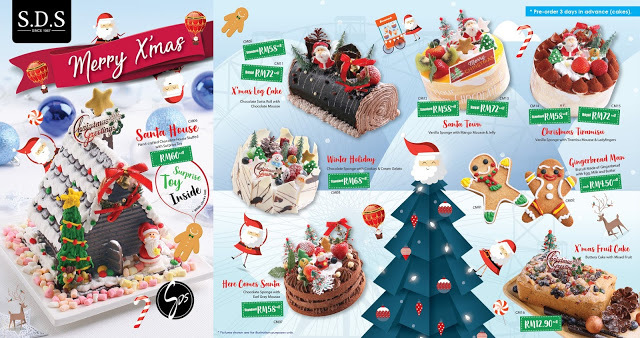 SDS UNVEILS AROMATIC CHRISTMAS’S DEAL, BRINGING SURPRISE TO KIDS | SDS has launched its Christmas menu and cake selections at their outlets and e-commerce. Festive doesn’t meant for just one day. Christmas has no exception as it is usually celebrated since November. 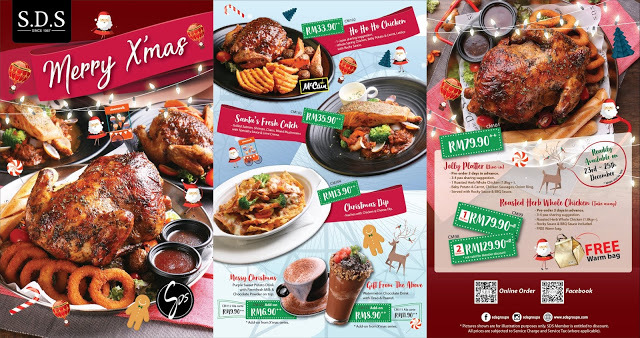 While the street is slowly adapting to the festive, SDS has become the latest to hop on the Christmas bandwagon to introduce their festive menu, and also cakes for celebration. 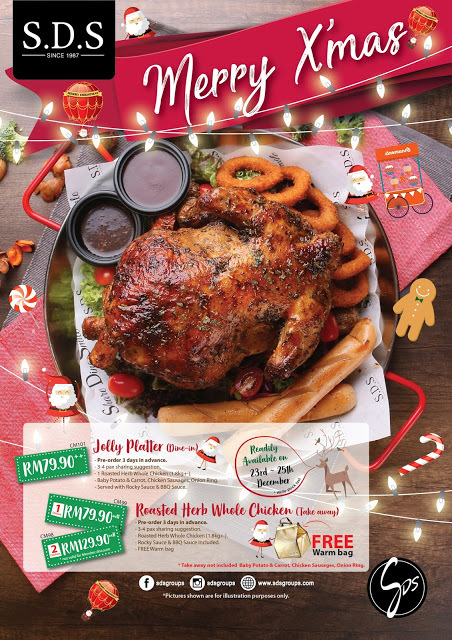 Customers who like to celebrate Christmas at home can choose to take away SDS Roasted Herb Whole Chicken as well. SDS member card holder is eligible for 10% discount when purchase one bird package. 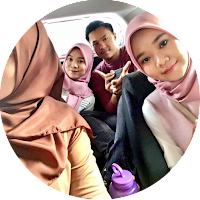 Large gathering may choose to take away two birds package at RM129.90 nett. Warm bag is available for free with every take away purchase of SDS Roasted Herb Whole Chicken. Pre-order 3 days in advanced is required for “Jolly Platter” for dine-in and also take away, and will be readily available on 23rd to 25th December. Along with Christmas celebration, SDS is going to organize Christmas kids drawing contest to unleash their creativity in complete comic with title, “Help Santa to Find SDS” which will be combined and printed as limited edition Christmas greeting card finally. 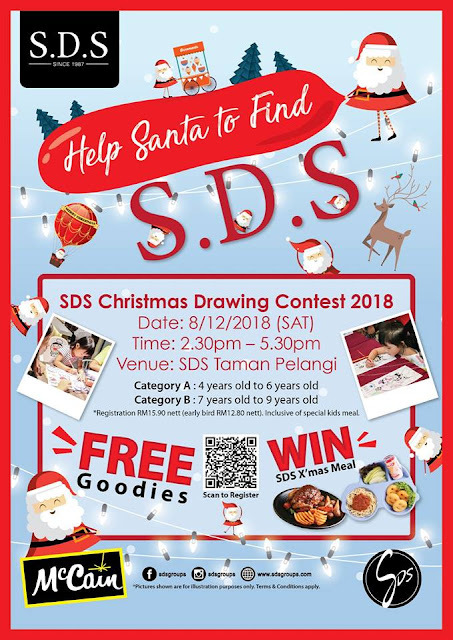 In collaboration with Washington Potatoes, McCain, the contest will be carried out at SDS outlet located at Taman Pelangi on 8th December, 2.30pm. Two categories, which are Year 4 to 6 and Year 7 to 9 available for kids to participate. Early bird who registers before 5th December is eligible for discounted price, RM12.80 nett (usual price: RM15.90). Price inclusive of special kid’s meal and free goodies which included kid’s plate set, water bottle, merchandise and so on. They also stand a chance to win trophy and SDS Christmas meal.